Bar & Beverage gets to the fore front of outdoor dining and entertaining rather quickly. It is important to create that help yourself persona throughout the life of the party with the exception of catered events of course. The choice for outside refrigeration, ice and wine coolers is paramount to the outcome of the party. Choosing a well known refrigerator is well worth it and best if it is proven successful outdoors. In the heat of the summer these units really work hard. 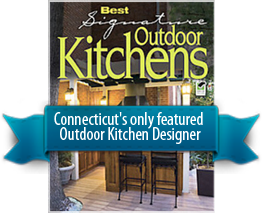 Keep in mind the outdoor kitchen usually narrows the choice of units to under counter sizes much smaller in nature than your indoor counterpart. The outdoor appliance selection can be broken down into refrigerators, beverage coolers, keg orators, wine coolers, freezers and ice makers. All integral parts of outdoor dining and entertaining. Most manufacturers offer stainless door fronts and have access to powder coated panels to match the rest of the outdoor cabinetry. Better units offer glass fronts with back lit LED illumination. It is definitely an appliance that delivers value within which you pay for. Having multiple bar & beverage coolers accessible in many parts of the outdoor living space keeps peeps and guests from entering the personal indoor kitchen looking for a bottle of water or drink. The bar & beverage side of things usually calls for a combination or host of outdoor refrigeration separate from the outdoor refrigeration necessary for the cooking side of things. Usually best suited for cooking outdoors is a two drawer pull unit offering to see whats in the drawer without bending down. In many of our luxury Outdoor kitchens we use a two drawer pull refrigerator nearby the cooking sources and a beverage cooler anchoring the end of one of the kitchen islands making it both visible and accessible to guests without much bother. A beverage center differs from a refrigerator in a way that the inside is configured differently to accept different sized bottles and beverages.